As you know, we’ve been following the development of the SEND inspections developed jointly by Ofsted and CQC. Barney has even written a helpful guide for parents to help you understand what they're about. The inspections began in May and so far, results have been made public from seven LAs. Check this page to see if yours is one of them. So far, there are reports for just seven out of 152 local authorities in England, though to be fair, they’ve only been going since May. However, as we’ve said before, if they had starting developing the accountability system at the same time as the special educational needs and disability reforms, then a yardstick for what was expected of LAs and the NHS could have been understood much earlier on, instead of only starting 18 months after the reforms were implemented. But we have what we have so while the inspectors may give written spankings to many of the LAs/NHS, it is families who have, and continue to, suffer through the chaos up and down the country. The outcome letters from the joint inspections are somewhat lacking in details of what is supposed to be a thorough five-day long inspection. Is this the only feedback given to those inspected, or just the public version? Perhaps some of it was verbal and if so, I hope someone wrote it down, somewhere. "Inspectors spoke with children and young people who have special educational needs and disabilities, parents and carers, representatives of the local authority and National Health Service (NHS) officers. They visited a range of providers and spoke to leaders, staff and governors about how they were implementing the special educational needs and disability reforms. Inspectors looked at a range of information about the performance of the local area, including the local area’s self-evaluation. Inspectors also met with leaders from the local area for health, social care and education. Inspectors reviewed performance data and evidence about the local offer and joint commissioning." The effectiveness of the local area in assessing and meeting the needs of children and young people who have special educational needs and/or disabilities. We would like to know, if you are in one of the areas already inspected, were you thus informed? Especially if you are not part of a Parent Carer Forum who you would expect (at a minimum) to be told of the impending visit. The Local Offer: Some areas found it was little used, while some parents said it was hard to find what they wanted. 16-19 provision (with exceptions) was not going particularly well. Health engagement: Lack of effective engagement by health services including GPs. One area had no money for an NHS Designated Medical Coordinating Officer to ensure the health input into an EHCP is done. In one area, where the DCO had pro-actively prepared a questionnaire for SENCos to list a child’s involved health professionals, it wasn’t being utilised. One area where no one was doing well is apparent: EHCP Transfers. Timescales are not being met and when they are, the quality of the EHCP suffers as a result. And this is where the children already have a statement and so their SEND are already largely known. For new entrants to the system, it may well be much worse. Some areas reported good levels of involvement of parents. This was mentioned in strategic terms for working with Parent Carer Forums although in one area, parents said they were consulted at a strategic level, but their views were then ignored. On an individual level, many parents said they felt involved with their child’s SEND provision in school, but some said the things they had told health professionals were misrepresented in reports. Having read through the reports so far published, we are a concerned that there is no real 'drill-down' detail in the reports that point to not just what isn’t right, but why. Nor are there any recommendations on how to improve. Are these published reports everything that inspectors have found or are they each just a summary for public consumption that fits in with the standard headings given? If so, where is the rest of it? 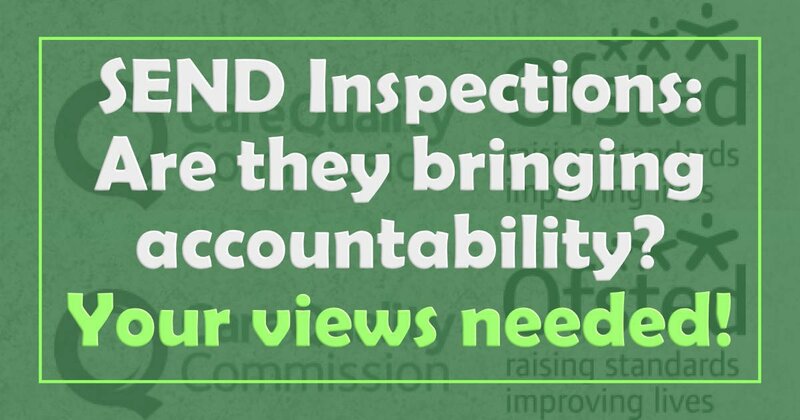 While inspectors may have had in-depth talks with LA department heads over and above these reports during the actual inspections, it is extremely important that parents and the public know, transparently and in detail, what has been said and every aspect that was inspected. How can the inspections bring improvements? How are LAs supposed to improve based on these reports? Where are the points to act on? How can parents hold them accountable for any improvements that are made as a result? Indeed, how can parents actually hold their LA accountable for where they are currently failing disabled children and their families? Or is this just supposed to be a tick-box exercise? Accountability inspection? Check! After everything that families have been put through and after the delay in inspections for so long, disabled children and their families surely deserve better. This is so fundamental that whoever is in charge here should be answering some very serious questions. Why are SMART targets important? What is the point of a report without actionable recommendations? Identifying the issues is only one step (and it’s debatable whether these reports do that thoroughly. We’ll leave that for parents in those areas to decide). Without targets for improvement that are Specific, Measurable, Attainable, Realistic and Timely, how can local authorities understand how to move forward? Perhaps Ofsted/CQC are expecting each LA to sit down with their respective reports and do something about them. Who’s gonna make them? Parents? The DfE and its Regional SEND Advisors? LAs need to be told EXACTLY what they are doing wrong - including illegal practice and failings in cooperative working - and that needs to be made public as part of the report. Then, steps to rectify these issues should be spelled out. We get that this is a first inspection and LAs need to be helped more than punished, but a report without any detail in either faults or recommendations gives them nothing to work with. What also needs to be done is the areas of good practice that have been noted should be highlighted, detailed and spread around. If it works, tell others so they can do it well too. Stop making each LA invent the wheel and give them something tangible and proven to work with. Additionally, if there are no detailed findings, how does anyone know if improvements have been made? Notably, these reports have no kind of grading of Poor, Adequate, Good, etc. While it is true that there is no previous yardstick, an experienced inspector or SEND expert surely knows what ‘good’ looks like? How many parents in areas whose results have been published actually agree with the findings and feel that they match their own experience? We’d like these answers and we think you would too. When your area has been inspected, come back here and fill in this form. You can find out if yours has been here. We’ll add to this as more are announced and re-share the post each time we add a new LA. To help us build up a national picture, please read your area’s SEND inspection report (believe us, it won’t take long) and then fill in the short survey below. You DON’T need to go into detail about your own family’s experience so it should be a short survey. Special Needs Jungle was founded in 2008 as a personal SEN blog by Tania Tirraoro. It is now a multi-author, award-winning site covering special needs, disability, mental health and rare conditions in children & young people birth-25 years. IF these follow the same pattern as other Ofsted inspections, there will be much more case specific feedback available to the LA and a timescale for improvement. The LA are expected to produce an improvement plan which has to be submitted to the DfE for approval and a date for re-inspection agreed. Buy I did say if…. As there is no grading given I am not sure where the incentive to bother would come from. I think there’s one main thing that makes the inspection outcome letters a bit jarring for us parents: and that’s the fact that we aren’t the envisaged customer for these reports, the Department for Education is. We’re used to thinking about Ofsted reports in a very specific way – the template used for school reports. Grading, hard-edged judgements, real punitive consequences – rightly or wrongly – for schools that don’t make the grade, and an understanding that external monitoring with teeth won’t just be confined to a multi-day inspection. These reports are aimed at informing parents – and many parents (not so many parents of kids with SEND, admittedly!) make choices off the back of these reports. The local area SEND inspections are fluffier: no grading, softer-focus, a lot of ‘on the one hand, on the other hand,’ loads of PowerPoint-fuelled jazz-hands narrative about strategy, commissioning, delivery, and mechanisms. And that’s because the DfE is the prime customer. Not us. The DfE wants reassurance that the reforms are being implemented well – that’s the task they set Ofsted. They want reports like this – in tone, in structure, in content. And arguably, what they want are good-news stories. Most of us parents want to see something different from these inspections – and that’s pretty much everything you’ve put above. Most of all, we want to see something that actually drives organisations – who currently exist in an accountability vacuum – to behave competently and lawfully. And these inspections can’t deliver that. These inspections have no teeth – the framework is designed so that the worst a local area can experience is having to write a letter to explain what they will do next. They’re just informing the DfE. They cannot – and will not – drive improvement in their current form. There is another reason why the actual execution of the inspections is likely to be deeply flawed – and that’s the intimate involvement of senior LA SEN managers in almost every inspection team as subject matter experts. These people have been specifically seconded to Ofsted to help with the local area SEND inspections. Most of the LA SEN managers Ofsted picked cannot deliver a quality service in their home LAs – and some of them aren’t even willing to deliver a lawful one. When you see just how poor the performance of some of these inspectors is in their home LAs, it’s not surprising to see an acute poverty of expectation reflected in the Ofsted inspections that they are involved in.